Surprisingly, I do not plan on using so many knots in my blog posts. I have sprinkled this word into titles, in descriptions, and in simple DIY steps. A word I rarely use outside of this computer screen, I feel like it is almost necessary to bring knot into my daily life. “What’s the weather like today”, someone will ask and I will reply, “My stomach is in knots because of the downpour”. Will my stomach be in knots? Probably not. Added to the fact that I will look like a nut case if it’s not raining. I am knot even joking. Almost overnight, these hanging baskets took the world by storm. In grocery stores, trade shows, and online, Macramé hanging baskets are making a come back. A huge comeback. Before you go out and buy one, follow these simple steps to create your own. It’s significantly cheaper and a great stress reliever. 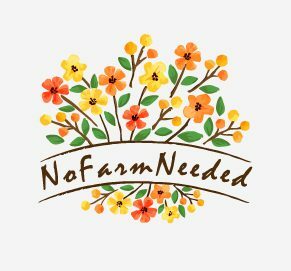 Or skip the steps and check out NoFarmNeeded on Etsy to get a few of your own! Cut your rope into 8 equal size strings then tie the ends together. Always assume you need more length then you actually do… I did my arm span. The marriage is back on! Tie your original buddies together in the middle of your pot. Plan where you are putting your container to know how much length you need your pot to hang. Once decided knot all 8 strings together. Macramé pots are easy to make and look great hanging anywhere around your house or office. Not really into making them yourself? Go to my Etsy shop NoFarmNeeded, to get your hands on a few. At least you know who made them! That’s it… finally ending with the last knot. Oh my! I remember these for Boston ferns and spider plants! Spider plants would look great in them! I might have to get myself some. Just remember that they grow like weeds!